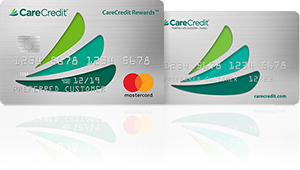 CareCredit health, wellness and beauty credit card. For Cosmetic and dematologic procedure financing. Whether it’s plastic surgery, facial rejuvenation or a skin care visit, you shouldn’t have to worry about how to get the procedures you want. That’s why we’re pleased to accept the CareCredit health, wellness and beauty credit card. CareCredit lets you say “Yes” to recommended surgical and non-surgical cosmetic procedures, and pay for them in convenient monthly payments that fit your financial situation.